Looking for some guidance to help me diagnose some vibration I am getting from my E90 335i. Never noticed anything previously, then got a new set of tires all round, replacing the runflats with S001s. Now get a vibration/shake through the steering wheel at speeds from 90kph+. Also sometimes get some vibration under braking, I don't recall noticing this before, could be related or a coincidence. I assumed it was a balancing issue so took it to the tire place across the road for them to check, they rebalanced but said it was pretty good (I'm assuming the place that fitted the tires in the first place also did a balance). Made a small improvement but there is still noticeable vibration there. My question is do I take it to a specialist wheel alignment/balancing place for another look (do they have better equipment than your local Firestone etc), or do I start looking at other things suspension etc..? what type of wheels do you have? 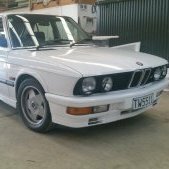 is it genuine BMW? Maybe the tyre shop lost a hubcentric ring while taking off/putting on the wheels. Yes, they are factory 17" Msport wheels. also why did you go to a different shop and just do another balancing for no reason? you should have gone back to the same shop and tell them about the issue and let them figure it out.. bit late now..
check if the tyres are mounted correctly - directionally, inside face outside face, wider on the rear and narrower on the front etc. Explain the issue to the original tyre shop and let them work it out. Could be a faulty tyre. +1 take it back. They may have moved the wheel positions on the axles ie putting back wheels on front etc. If one of the rear wheels ain't quite perfect could cause a vibration when moved to the front. Getting a wheel alignment is always a good idea also with new tyres if you havent had one for awhile. check that the little printed circles on each sidewall are beside the valve stem. that's a good place to start, when figuring out if the tyre shop had a clue or two. As Kyu asked, not understanding why you didn't return to the original tyre fitters when you first had concerns. You've certainly complicated things. The other day i put brand new tyres on 18" wheels from 17" both e39 hub centric wheels on my 530i e39 & almost straight away after pulling out of work wash bay was getting the shakes. First I thought mabe I water blasted off a wheel weight lol. Im sure all it was, was a stone stuck in the tread of the new tyre as since the problem has cleared. Sometimes new tyres will tell you something in suspension is on its way out, even swaybar bushes.